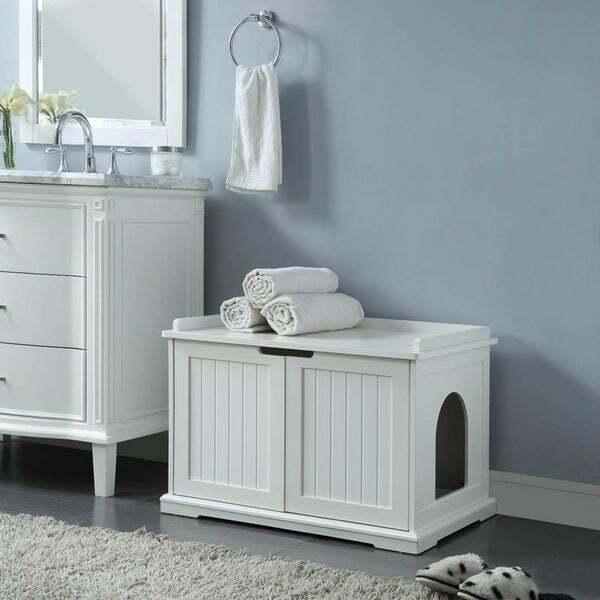 Multi- Function Cat House：Beautiful night stand hides your cat's litter box or bed. Stylish furniture look blends with your home decor. Easy-to-Use：Pull out, clean and slide back under the counter. Extra shelf space to organize your kitty gears, magazines, the tv remote, etc. Durable Design：Made of quality MDF and metal hinges. Accommodate most of litter boxes. Quick Assembly：Straight forward instruction included. Ready to use in 1 hr with Philip's screwdriver(not included). Interior Dimensions: 26.81"W x 18.78"D x 16.62"H.
Dimensions 20.9 In. X 19.0 In. X 26.6 In. I bought this for my niece who has a small apartment. It was a gift for her so that she could have a cat litter box in the living area but yet keep it concealed. She assembled it herself and it only took about a 1/2. She is in love with it! Looks as nice in person as in the photos. She is making a cute cushion to go on top of the bench to make it look a bit more like a piece of furniture. Her cats will be able to lay on top and look out her front living room window. I highly recommend this product. Well made pieces. Assembly was not difficult. Once assembled, it seems a bit loose but that could be the fault of the assembler. Clever concept of inner wall keeps my standard poodle from reaching the litter pan. It’s super cute and a great size, fast ship, but gave it a 3 star instead of a 5 because the chemical smell that came with it is terrible. It’s sitting outside after trying everything to get the smell out so that it will be safe to have it inside the house. It was made in China and they must use some super strong toxic chemicals. I’ve had it put together for a week and not able to use it yet. Hopefully it will have a “cleaner” smell so I can bring it back inside in a couple of days and actually let my cats use it. No fault of Overstock. Strong chemical smell. Hope it goes away soon.